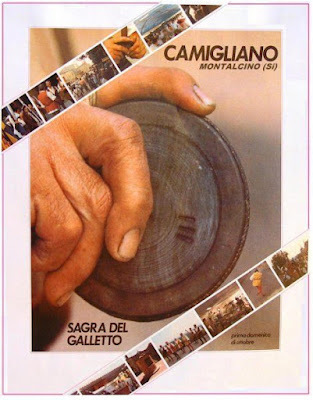 You know fall is in the air when you see the Sagra del Galletto in Camigliano on the calendar. 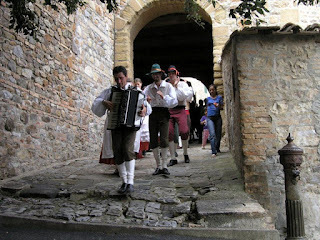 The first weekend in October wakes this sleepy corner in the municipality of Montalcino to its busiest time of year. 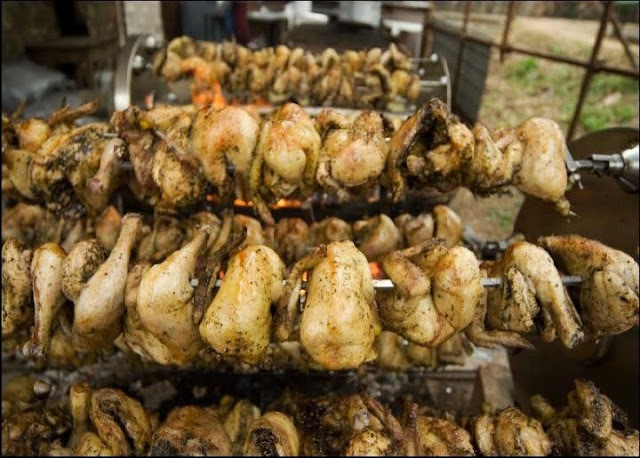 The grill, tents and tables are set up, the Pozzo dance floor is swept clean and, most importantly, the kitchen fills up with different generations who come together to prepare local specialities. The star of this sagra is the Galletto, or rooster, but this ain’t no coq au vin. Get ready to wake up your taste buds with the spicy slow-cooked Scottiglia stew or stick with the no-frills but no-fail grilled fare. Sagra-goers return year after year to feast upon their favorite dish. After almost everyone starts with the crostini, some people pick the tagliatelle al ragù while others prefer the zuppa di pane. Some regulars skip the galletto altogether and indulge in grilled meat, fegatelli with a side dish of white beans, fagioli all’uccelletto. All this accompanied by the best in local reds from table wine to Rosso to Brunello di Montalcino. What better way to finish off this hearty Tuscan meal than with homemade crostata baked in a wood-burning oven and a glass of Moscadello? Is your mouth watering already? Come down for dinner at the Sagra del Galletto on Saturday, October 5th when the Pozzo disco reopens for one night only. It’s usually a rockin’ time. On Sunday, October 6th, experience tiny-town Tuscany as it once was. After the traditional Sunday lunch, everyone gathers round as the Trescone folk group ushers in flag-bearers of two nearby castles and the four quarters in Montalcino in addition to the six local men who will compete in the Druzzola tournament on the road that leads up to Camigliano. 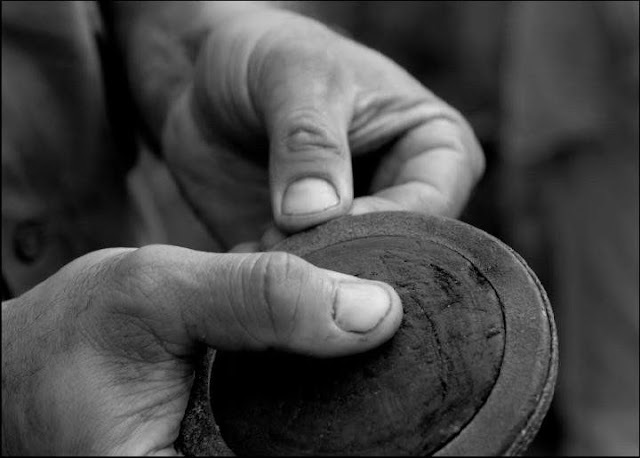 The druzzola is a twelve-centimetre olivewood disc with an iron rim. 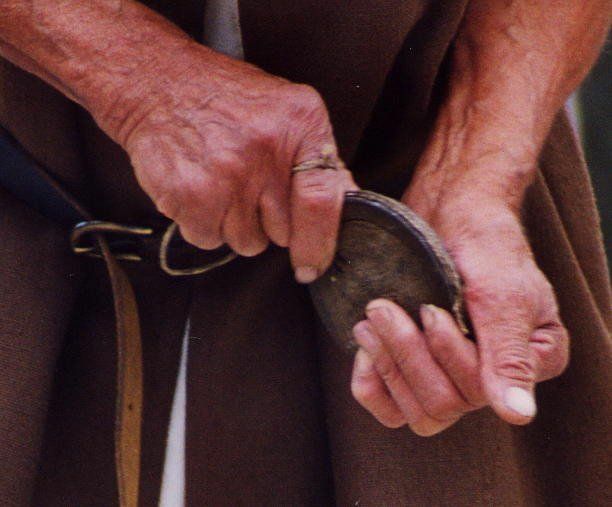 People of all ages have played this game for centuries in this area, but Camigliano is the only place in Italy where it is called druzzola. Here, each of the six competitors has his own technique to wind the string around the disc and throw, reaching even as far as 200 meters. After three tries, whoever throws the furthest wins. But before all the throwing begins, there is Trescone folk dancing and hand-clapping and a draw to match the six competitors in medieval costumes to their teams; Camigliano, Poggio alle Mura Castle, Borghetto, Pianello, Ruga and Travaglio. After the tournament, everyone returns to the Pozzo for the awards ceremony, lottery draw (the winner of the druzzola determines the top prize in the lottery) and a little more Trescone until Cammello e Lucia take the stage providing music of all genres for dancing until midnight. On Sunday evening the kitchen is still open, but take your chances… some dishes on the menu may be sold out by then. Actually, the real star of this sagra is the community. 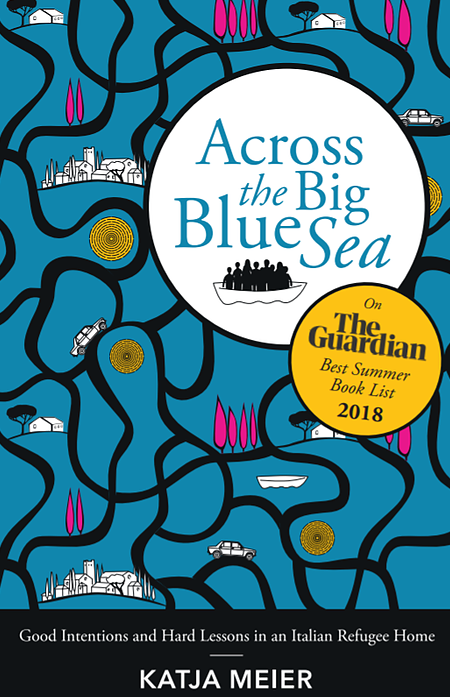 Most members of the Cultural and Recreational Association of Camigliano don’t live in this small cluster of houses, but each person has some sort of connection to this special place whether it be through grandparents or friends. Year after year they welcome everyone back for a whole lot of good food, good wine and good fun just because they love to, well, spend some time together. SAGRA DEL GALLETTO: Saturday, 6 and Sunday, October 7, 2012 and every year on the first weekend of October in Camigliano (20 min. from Montalcino, check location on google map). 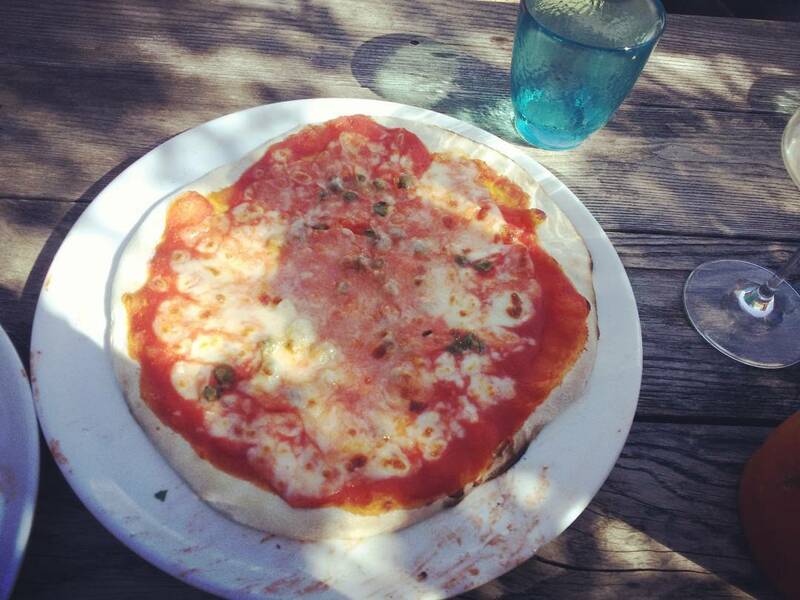 One word of advice, this sagra has become so popular that you need to book in advance. Check the website (or the facebook page) for the programs and directions, but do reserve your table by calling +39 335 5695919. Lisa Maria Annicchiarico is an Italo-Canadian English teacher, translator and writer who has chosen Montalcino as her Italian base. 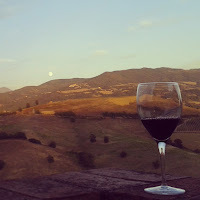 If you plan a trip to Brunello town, make sure you check out her tips for a day in Montalcino, written for the Florentine, the English language newspaper from Florence. She also wrote PINK, a wonderful children's book with a message, which so deserves a great publisher. Know of anybody? Get in touch with her here via Facebook. 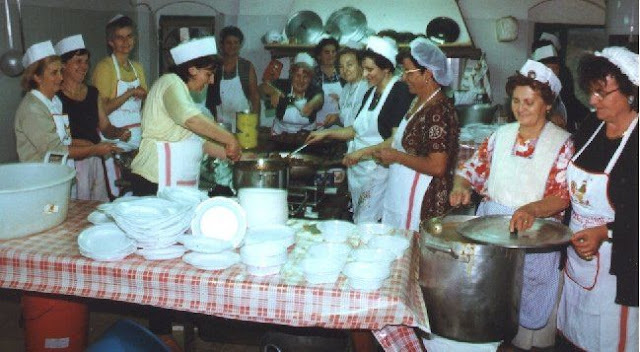 And if you're an English speaker needing a hand with translating the menu, ask for Lisa in the sagra's kitchen, where she can be found cooking (and jesting!) along with the village ladies.